The Oh So Yummy Results! First of all, if you are on a diet, don’t bother reading this post, LOL!!! If I had to pick one food that spells C-O-M-F-O-R-T to me, it would probably be potatoes. And what a versatile veg the super spud is. One of my fav ways to prepare potatoes is scalloped. This is my version of this comfort family favorite, from Not Just for Vegetarians. Rich and delicious, these really can be a main course, accompanied by a green salad (or soup) and perhaps add another vegetable dish. Satisfying and delicious. Rethink your ideas about potatoes as just another side dish!! These luscious potatoes are extra-rich and satisfying. A full meal when accompanied by a green salad and vegetable. Also a great side. Serves 4-6 generously. 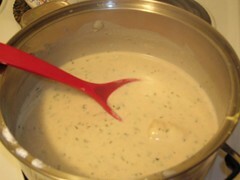 Precook the washed but unpeeled potatoes by simmering them in plenty of water, for about 30 minutes, until tender. Cool and peel . Preheat oven to 375. Grease a large (8 C.) casserole dish. 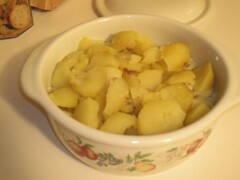 Slice the potatoes into casserole, layering with the diced onions. Set aside. . In a medium saucepan, melt butter over low heat, gradually add the flour and milk and continue to stir until smooth and thickened. Add all remaining ingredients except the paprika and continue to cook and stir over low heat until sauce is smooth and cheese is melted. Pour sauce evenly over the potatoes and onions, sprinkle with paprika. Cover and bake for 40 minutes or until potatoes are slightly golden on top.Remove cover for last 5-10 minutes of cooking time to ‘crust’ top. Recipe from Not Just for Vegetarians, Delicious Homestyle Cooking, the Meatless Way, by Geraldine Hartman. All rights reserved. 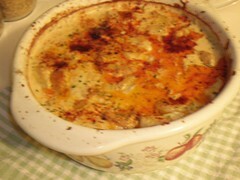 Hmmm…never thought of adding mushroom soup to scalloped potatoes…what a great idea! Potatoes are a wonderful food! Yum! Potatoes are one of my all time favorites in the veggie realm. I’ve learned that any food can be a “diet food” if you think about moderation and portion size. I was glad to have figured that out since potatoes were not going to be removed from my menu! I think I will have to try this recipe out. I just LOVE scalloped potatoes. Wow does this ever look good. This might make the Thanksgiving table! Happy Thanksgiving to all my buds in the US. I agree Caroline, this would be an excellent choice to add to Thanksgiving Dinner. my mouth is watering just looking at that casserole!!! i can’t wait to try it. Yum–I agree, scalloped potatoes are sublime comfort food! Thanks for sharing this version! And I’m looking forward to the lentil casserole recipe when you post that, too. Looks like I have quite a bit of back-reading to do here!